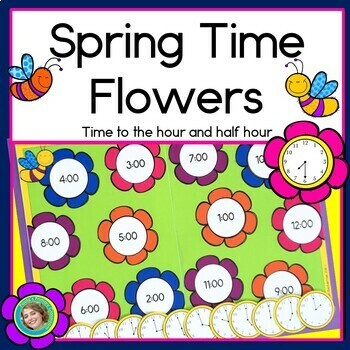 Spring flowers and telling time come together in this fun spring themed first grade learning activity! Spring Time Flowers covers telling time to the hour, half hour, and a mix of the two, using both analog and digital clocks. 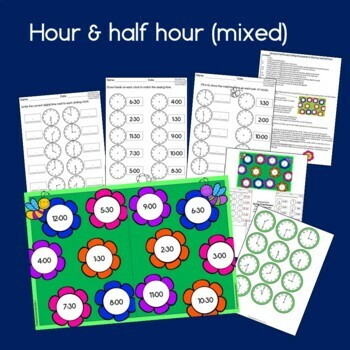 There are 3 folder games, just right to use at a math center (time to the hour, the half hour, and mixed review). 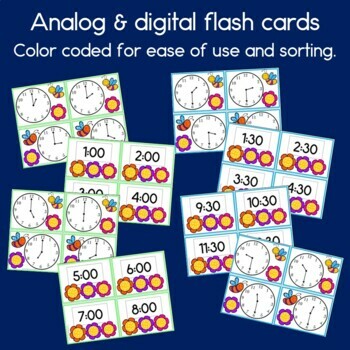 Large time cards for all hour and half hour times, in both analog and digital form are provided for sequencing and matching activities, as well as whole class learning games. Give students a whiteboard and a small clock, hold up a time card, and have them show it on their clocks or board - you will be able to instantly see who "got it" and who needs more help! Spring Math Bundle for First Grade along with 5 other great resources - and you save 20% by choosing the bundle! Not sure if it's right for your students? Try the free sampler, which includes a page from this resource: Spring Math Bundle for First Grade FREEBIE!. "My class love using the games in maths rotations!" "Good practice pages for my first graders!" 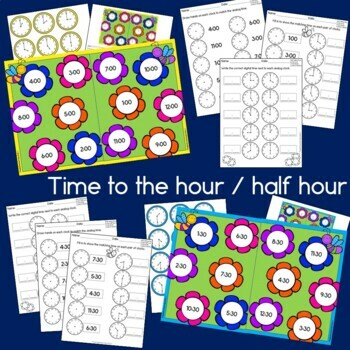 You may also be interested in more Telling time activities.